Barbershop haircuts are great – you get to sit down, get pampered, and come out feeling like a million dollars. There’s the rub, though – you often leave feeling like you just overspent. 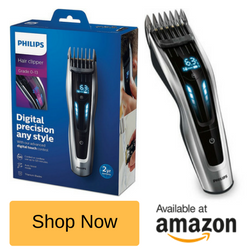 Luckily, the Philips HC9450/13 hair clipper set makes it easy to get professional barbershop results at a fraction of the cost, in your own home, any time you need a haircut. Digital swipe action and motorized combs for extreme precision. 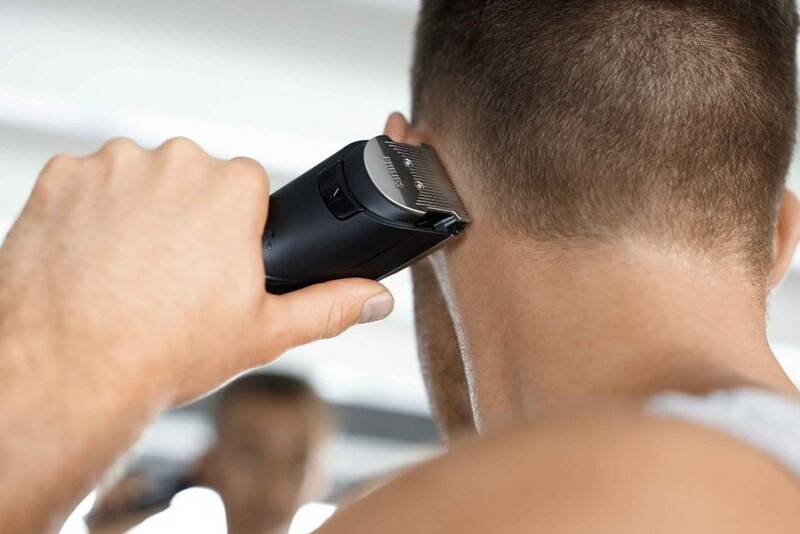 Uses DualCut technology – twice as fast as older Philips clippers. Over 400 highly adjustable length settings, from 0.5 – 42 mm. Intelligent design remembers your preferred settings. 1.5 hours of runtime from only 60 minutes of charging. Philips is well-known for their design expertise, and the HC9450 is no exception. 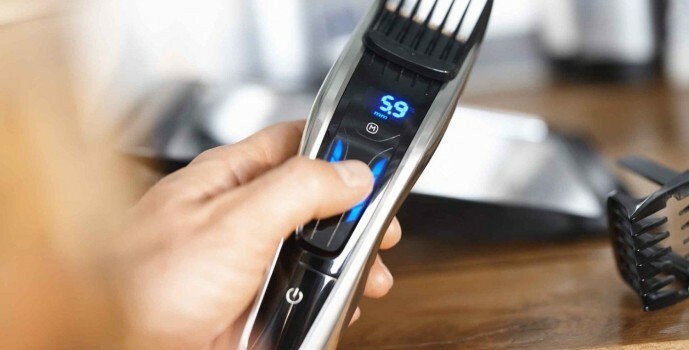 It uses a unique technology, which Philips has named “Digital Swipe” – a touchscreen that lets you swipe through over 400 settings, choosing exactly the right length for your hair, quickly or in increments as small as 0.1 mm. 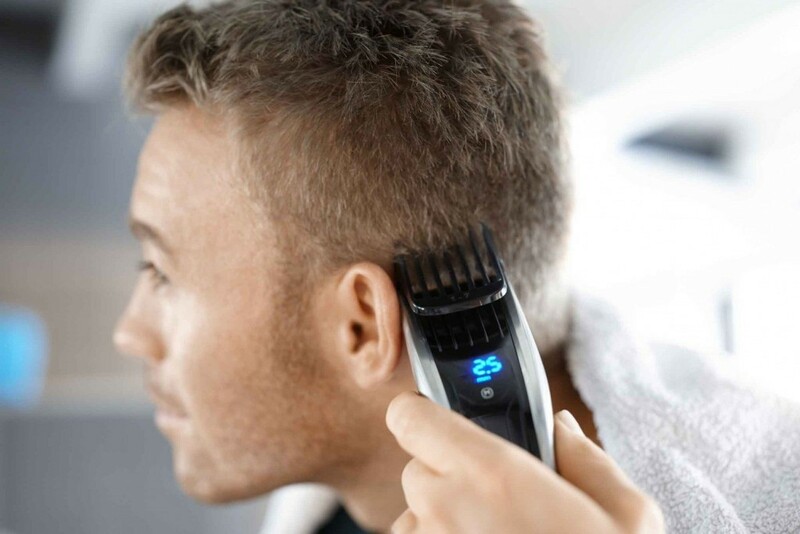 And unlike hair clippers which rely on a mechanical control (such as a taper lever) to make minute adjustments, the HC9450 uses a smart Memory function, storing and quickly recalling your preferences. I found the Memory function very easy to use – whatever setting I had it on last was recalled when I turned the unit on, and I could save up to three length settings for each comb. All it took was the single press of a button. 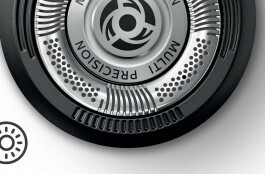 The battery status indicator is conveniently located on the touch screen, and the illuminated numbers are easy to see. Hair can be baby-fine or incredibly coarse. It can be thick, thin, straight, limp, flat, curly, wavy or bouncy. It might grow up, out or sideways, be dry, oily or somewhere in between. Everyone’s a bit different. 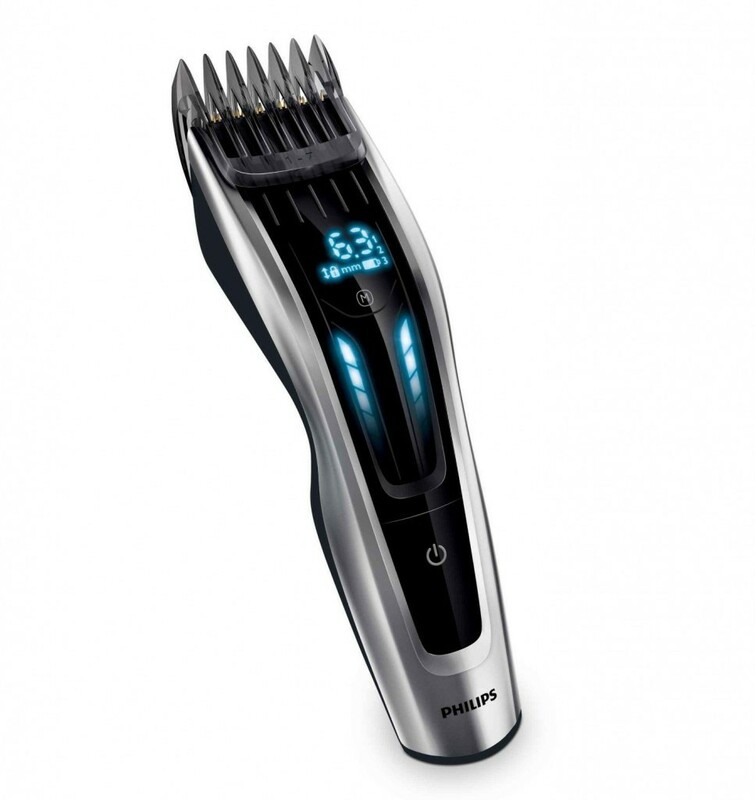 The Philips Hairclipper Series HC9450 is up to the job, no matter what kind of hair you have. 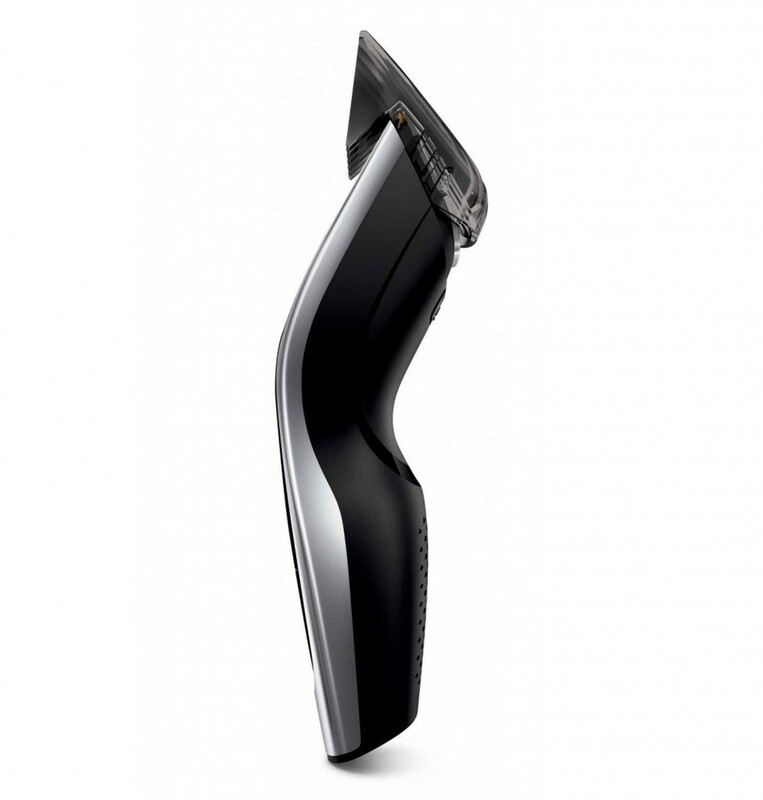 It utilizes enhanced DualCut technology, which cuts through any type of hair with ease. Is it possible to improve on perfection? Apparently, it is. 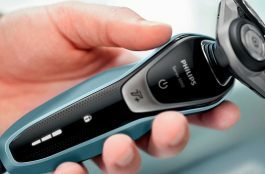 Philips clippers have always been good, but the new DualCut system features a special, double-sharpened cutting element which was integrated with low-friction engineering. In simple terms, this means it cuts hair at twice the speed of older Philips models. The blades are protected by a durable stainless steel guard, and are made of hard, self-sharpening titanium, which wears slower and stays sharp longer. The HC9450 can be used corded (plugged into a mains outlet) or cordless. The latter option is made possible by advanced lithium ion battery technology, providing you with up to 2 hours of cordless runtime after only 60 minutes in the charging stand. If you’re not going to use the clipper for a while, or travel with it, simply put it in the included hard case. The clipper is easy to maintain – just detach the cutter to clean it. Unlike many other clippers, this one doesn’t require that its blade be oiled. Speaking from experience, I found this a welcome feature – blade oil can be a bit messy, gets mixed with small pieces of hair and the small bottles it usually comes in have a habit of leaking. 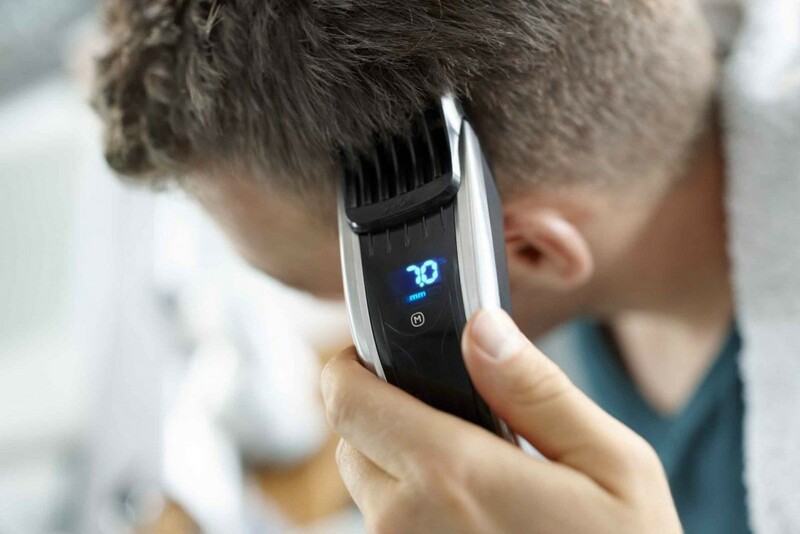 The included motorized combs work in tandem with the Digital Swipe system. The combs are powered by the motor and allow for incremental changes in cutting length of as little as 0.1 mm, giving you absolute consistency. If you want an extremely short cut – stubble length, which is perfect for hot summer days, thinning hair or just maintaining a neat and tidy appearance – remove the comb and shear your hair as short as 0.5 mm. Or use a different comb, and cut your hair from 1 to 7 mm, 7 to 24 mm or 24 to 42 mm. 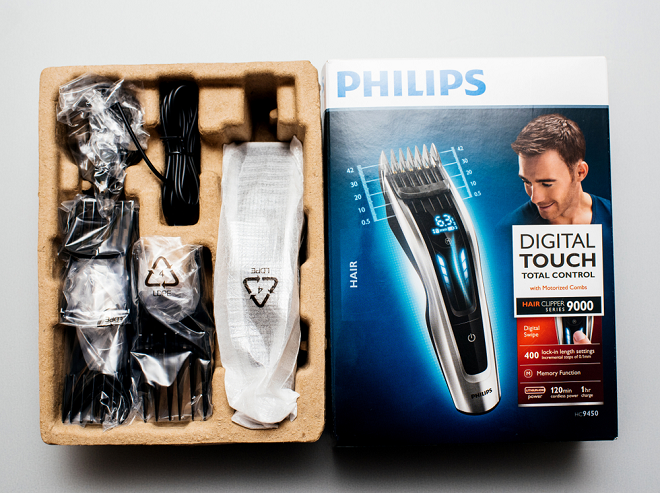 What a great hair clipper by Philips! 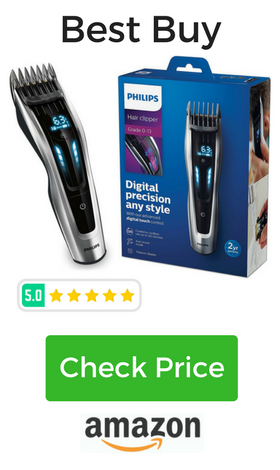 I’ve tried lots, and the Philips HC9450 is heads and shoulders (no pun intended) above much of what’s available at a similar price. I really appreciate the lack of tugging (something I’ve experienced with lesser clippers) and enjoyed – in fact, I’m still enjoying it – how long the blades stay sharp. This clipper has a sleek, high-tech appearance, but I think that’s only appropriate – it’s reflective of the fact that the advanced design and manufacturing Philips is famous for. If you cut your hair at home on a regular basis, it’s well worth considering the Philips Series 9000 HC9450 – 13.